You can stop sharing an item, see who it's shared with, or change the permissions others have to it, if you're the owner of the item. Note: You can't change the permission of a sharing link from edit to view or from view to edit. The way around it is to delete your sharing link and create a new one with a different permission. Select Remove Link to delete the link and stop sharing with that link. Select the password and change it, or clear the Set password check box to remove the password. Note: Password-protected links are coming soon. 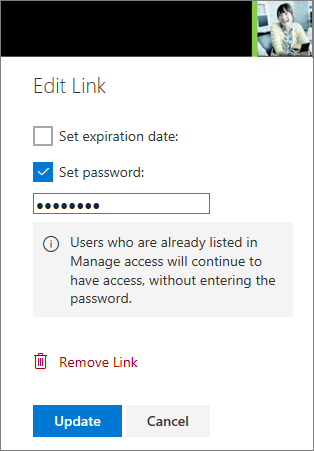 Update the link expiration date, or clear the Set link expiration check box to remove the expiration date from the link. If your Microsoft account is set with Family Safety, and your parent has turned off contact management, you can only share items with people who are already on your contact list. Please respect copyright and be careful what you share online. Copying or sharing unauthorized materials violates the Microsoft Services Agreement. 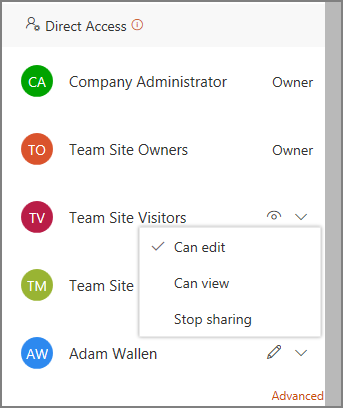 On OneDrive.com, select Shared in the left pane. If you are the file owner, you can stop sharing the file or folder. 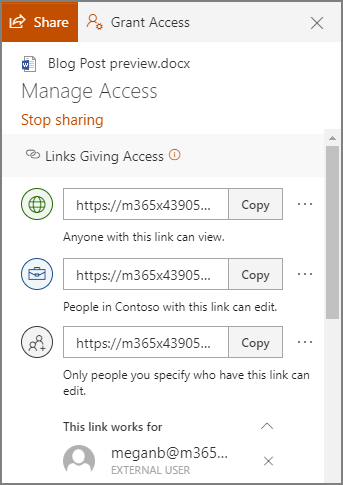 If someone has been given direct access, or has access through a specific people link, you can also change the sharing permissions between view and edit. To stop sharing the file entirely, click Stop sharing. To delete a sharing link, click the ellipsis (...) next to the link, and click the X. To stop sharing with specific people, expand the list under a specific people link and click the X to remove someone. If change permissions or stop sharing with someone who has direct access, under Direct Access, click the dropdown next to the person's name and choose the option that you want. Tip: You can also manage a file or folder's sharing permissions through the OneDrive desktop app for Windows 7, Windows 10, and Mac. All you need to do is right-click the shared file or folder in your OneDrive folder on your computer, and select Share, then select More > Manage access, and a dialog box will open on your desktop so you can make your selections as described above in step 3. On OneDrive.com, select Shared in the left pane, and then select Shared by me.